Five years from now, there’s a good chance that your entire board of directors will be different than it is today. This is especially true for nonprofits, trade associations, school boards, and other organizations that usually limit the number of terms a director can serve. 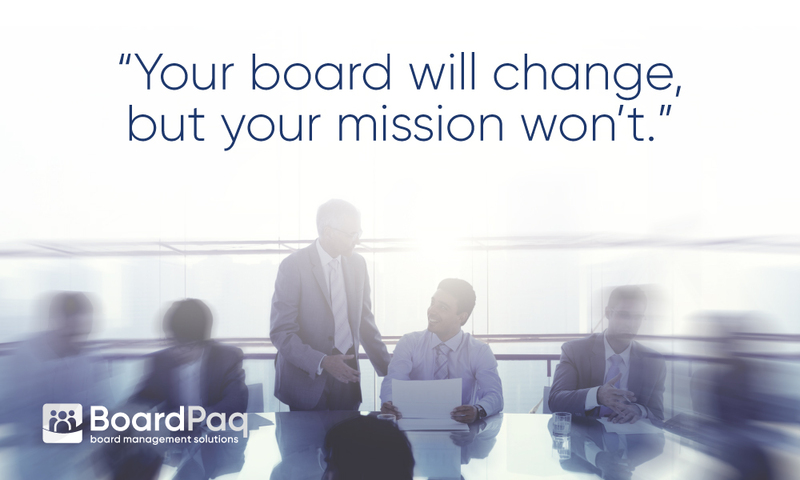 But, while your board may change, your mission will remain the same. For your future directors and staff leaders to achieve that mission, there needs to be continuity within the organization. Personally, I have seen what can happen when an organization doesn’t have continuity. A few years ago, I served as a consultant to a small trade association that was experiencing conflict between individual directors, and between directors and staff. The result was the abrupt resignation of almost half the association’s board and its executive director. The situation was made worse by the organization’s poor recordkeeping, spotty minute-taking, and almost complete lack of written policies or procedures. In other words, when I stepped in as a consultant, there was often no documentation of important decisions, and no record of the dialogue between board members that led to some of those decisions. However, despite the sudden vacuum in leadership, the association still had a mission. It still had members to serve. It still played an important role in the industry. It’s rare for nearly half of an entire board of directors to resign suddenly. Normally boards experience more orderly transitions, and an organization’s staggered terms usually help retain some institutional knowledge. However, even under normal circumstances, eventually an entire board will be replaced with new directors. That’s why having accessible, accurate, and thorough minutes is so important. They allow new directors and staff to step in and learn how an organization made important decisions. It’s also why having documented policies and procedures, a library of forms, and a record of the organization’s planning process is important. Having that information in an easily accessible, technologically friendly way is also about more than just making life easier for directors and staff. It’s about your customers and stakeholders not seeing disruptions in your organization when directors and staff inevitably transition off the board, or into new jobs. BoardPaq, the board portal of choice for cost-conscious organizations, is working on a series of new features designed to help you capture and retain the institutional record and knowledge your organization needs. The company is already the first board portal to offer a SWOT (Strengths, Weaknesses, Opportunities, and Threats) tool that allows boards to do collaborative strategic planning. Soon directors will be able to access conflict-of-interest disclosures, evaluations, and various other forms that will make it the first—and most affordable—comprehensive set of paperless tools for every board. I have worked for and served on a wide variety of boards. I know every board of directors has the best of intentions when it comes to documentation, preparing for transitions, and putting together records and resources for future directors. However, reality gets in the way, and that documentation is often lacking. Using a board portal allows those good intentions to become reality. And future directors will thank you for that.